The past couple of days have been devoted to completing required trainings for going out into the field. As has been constantly stressed to us, Antarctic can be a harsh environment with rapidly changing weather conditions, so safety and proper preparation are primary concerns. The temperature on the base has been in the mid to upper teens. The sun has been shining every day (and every night — it’s a bit freaky to wake up in the middle of the night, notice a bit of light leaking in from around the edge of the window shade, check the time, and discover it’s 3:30 a.m.). Yesterday was so windy that even though it was bright and sunny all day, they cancelled the incoming flight from Christchurch, and the stiff wind certainly made it seem colder than the other days. The ECW gear (as in “extreme cold weather”) they give you is very effective. Yesterday’s first training was snowmobile driving. Learned how to perform the safety checks, free the runners if their iced to the snow, and then how to drive it. Drove it up and down a gentle incline a few times, practiced turning, and then practiced how to shift my weight to keep it upright when riding over an incline such as a mogul (lean uphill, and swing both legs over to that side if necessary, in case you were wondering). Took that baby up to 15 mph — the local speed limit. Feels a lot faster when you’re riding the Skidoo than it does in a car though. Brought a helmet back to my room to have available for the duration. Add that to my resume! The afternoon was survival training for people going into the field, in case you’re dropped off somewhere and say, bad weather grounds your flight back so you have to use your survival kit. The survival kit is a duffel bag containing a bright yellow tent that’s easy to set up quickly, a camp stove, food, sleeping bags and other necessities. We practiced pitching the tent and lighting the camp stove in a large indoor area outside the classroom. The teacher is a mountaineer who works on the Search and Rescue Team here during the research season and at Yosemite the rest of the year. In between the hands-on portions were slide lectures, including some truly disgusting photos of frostbite that I could barely stand to look at (e.g. a large swollen foot the color of grape jelly), the point being to drive home the consequences of being unprepared to cope with the cold. Point taken: gotta take the ECW and the survival kit when you’re heading out, even if you ultimately don’t need all of it. 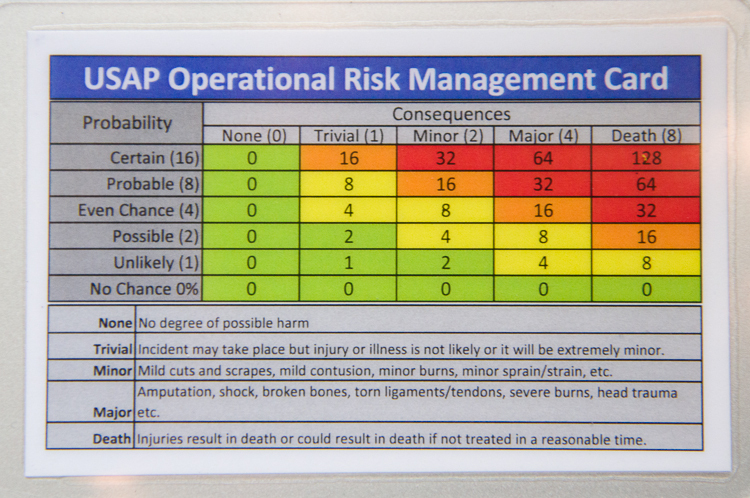 We were all given a little card (shown above) with a chart to help assess risks in advance — the idea being if it’s in the red zone, nooooo, what? are you crazy?! 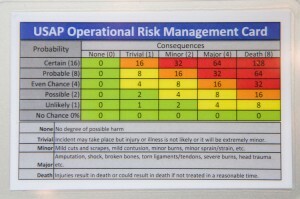 And if it’s in the yellow zone, that doesn’t necessarily mean you don’t do it, but you do pause to think through ways to lower the risks. We broke into small groups to read a scenario apparently based on an actual incident, in which a group of six workers got themselves stranded a couple of hours drive out of town in bad weather and had to be rescued, after making a series of bad decisions. What was interesting to me is that part of what got them into the terrible situation was what the instructor called being too “mission-focused” — i.e. they really wanted to get the job finished having come all that way to do it, so they pushed their luck instead of resigning themselves to having to leave it undone for another day with better conditions. Though the consequences haven’t been anything like life or death, I must admit I can get caught up in the quest for completion at times when it would be better to stop for the moment. Note to self: watch for those times when your “mission-focused” streak stops being an asset. On a lighter note, the air is so dry here that my hair has been completely straight, instead of the usually springy curls. There was a time in my teen years I yearned for straight hair and subjected myself to hot electric curlers to get it, but now that I have it without effort, I’m not exactly embracing the look. As I looked at my lank, flat hair in the mirror last night I suddenly realized that a lot of the people I’ve noticed walking around wearing hats constantly while indoors are neither cold nor making a fashion statement, but are doing their best to cope with a permanent bad hair day. This morning I hit it hard with conditioner, but I’m keeping the Indoor Hat Option, as I have named it (or IHO — everything here has an acronym), available if I start looking the way I did by the end of yesterday!